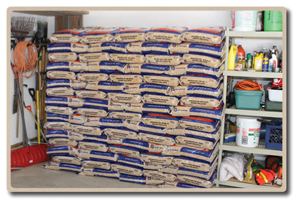 WoodPellets.com recommends storing your fuel inside in a dry area free from flooding, mold, and excessive humidity. Restacking the bags on the manufacturer’s pallet and cardboard slip sheet is a great way to raise your pellets off the ground and protect them from moisture. If you don’t have room to store your pellets in the garage or basement, the next best thing is a shed or shelter in a high, dry place. If you store pellets outside, carefully inspect your fuel when it arrives and repair any rips or holes in the plastic shrouding with water proof tape or additional layers of plastic. We strongly recommend adding an additional, securely fastened tarp over your skids, to protect from water and from any birds or squirrels that may puncture the plastic. Below is some season specific advice for keeping your wood pellet fuel safe and dry. During the summer months make sure your fuel is delivered to an area in your yard or driveway that is free from any water pooling or flooding. Direct water contact from below may cause water damage and render the pellets to its original form: sawdust. Also, be mindful of any irrigation heads or water spray paths as well. In addition, should there be any trees overhead or nearby, we suggest placing a tarp over the skids. This not only protects the packaging from constant exposure to the elements, but also keeps the leaves, dirt, and bird blessings from littering the shroud that protects your bags of fuel. Check on your fuel once in a while, just to make sure the chipmunks haven’t developed a condo association ! Now your fuel has been outside for a couple of months and you are ready to fire up your stove! Carefully remove the protective wrap and slice the shroud on the top edge of the skid in order to slip the top bags out. Leave the shroud on as long as you can. Use the shroud to protect the bags and cover with the tarp. Place a weighted object on top of the skid to keep the tarp in place. Shovel a path to your fuel and shovel around the entire skid. This effort will keep the snow off your fuel and help prevent any water and/or ice damage. Continue to use the shroud and tarp to protect your fuel from snow and ice. You’ve been warm and toasty all winter, and now it’s time for spring cleaning! If you have loose bags left, find a spot in the garage or keep them outside, just protect them from the elements – as described in the seasons above. Empty your stove’s hopper and keep an eye out for Spring Buy Pellet Fuel Specials!